Predicting future classics isn’t rocket science. It’s the bikes we rode as a nipper (which rarely make proper classics – more like ‘the people’s classic’) or those we dreamed of owning (those that make proper mega-buck classic status). 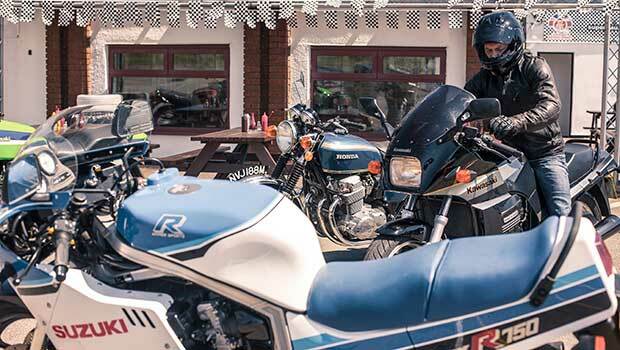 Which explains why middle-aged men spend £1000s on buying and restoring Yamaha FS1-Es, RD250/350LCs, all manner of rusty 125s (including MZs – have you seen the price of a decent 1980s MZ125 recently?) and, at the other end, all those sooper-dooper top-spec Wunder-bikes we wanted, but could never afford. Not that long ago you could buy a knackered-but-complete Yamaha LC for a few hundred quid. Everyone understood it had been thrashed, crashed, stolen and recovered and that it was basically fit for scrap. These days those immaculate, ‘never-raced’ matching-numbers, expensively-restored show-ponies sell for fortunes to wide-eyed, droolers with very short memories. Next up will be Suzuki’s Bandit because a generation of new riders in the late 1990s either had a Bandit 600 for their first big bike or wanted the 1200 because it was a brand new, GSX-R-powered wheelie-monster for less money than a three-year-old ZZ-R1100. The Bandit’s launch co-incided with the Direct Access test where new riders could learn on a big bike and skip the traditional route of working their way up through the capacities. These riders were older than previous learners with more disposable income to buy and run a bigger machine. The 1995 Bandit 600 wasn’t the first budget middleweight – Yamaha launched the Diversion in 1991. But the Suzuki was better and its timing was perfect. Firstly, it was cheap – pretty much half the price of Honda’s CBR600F when launched. Secondly it was a great-looking, full-sized, credible motorcycle. Thirdly, it had enough performance and handling to let new riders master a motorcycle without being too fast or difficult in corners to scare the living daylights out of them. When the 1200 arrived a year later it had all the above plus a large additional kick up the backside too. The secret was simple; Suzuki used existing parts from other models in a simple chassis with classic good looks. Engines, suspension, brakes, wheels and electrics were lifted from the GSX-R, GSX-F or RF parts bins. The 600 engine came from the underrated GSX600F, which itself was a sleeved-down, detuned GSX-R750. It made power in a non-threatening, linear manner that matched the stable, predictable handling of the chassis. And experienced riders previously locked in the used bike market could afford a brand-new machine and get to enjoy the performance and handling of a bike that hadn’t been thrashed, crashed and wheelied to death. Which, for most of us was a real lightbulb moment. Fast forward 20 years and you can pick up an early Bandit 600 for under £1000 and a 1200 for a little over that. You’ll notice I didn’t say ‘a good one’ because there are hardly any good early ones out there. Just like those old Yamaha LCs, Bandits are now at the stage where pretty much everything is rusted, saggy and worn out, whatever the seller says. So, leave the rose-tinted specs at home, understand your mechanical limits and buy the cheapest complete runner with an MoT and clean HPI history you can find. This isn’t a bad thing – your new bandit will be a rolling restoration. Get it running right, then sort the chassis and worry about the rest later. Most spares are still available and those that aren’t are plentiful second-hand. Watch out for bent subframes because the substantial exhaust mounted directly to the steel subframe, which was welded to the main frame and so a small tumble on the rhs could bend the frame and write the bike off. Also understand that at this end of the market a bike often gets sold when it needs a service so can go for years without an oil change or valve check. And unless it’s had new seals, assume that the fork oil is at least ten years old too. Rear shocks will be scrap, linkages will be seized and brake calipers barely functioning. The clutch will be worn, carbs too, airbox (if present) will contain a filter unchanged in years and the ignition switch and sidestand will be stiff in that way that all old Suzukis are. And of course, the electrics will be butchered where the aftermarket alarm was fitted and then removed, steering head bearings knackered along with wheel and swing arm bearings too. There will be other things wrong with the particular one you buy but all the above are common to pretty much every old Bandit out there. So, don’t be surprised, be realistic. Pay the right price and enjoy the project. Early Bandits make a great first restoration because they aren’t yet rusty enough that you can’t get them apart and everything you need is out there at a decent price. In ten years’ time when prices have gone through the roof, you’ll be the acknowledged internet expert; king of the Bandits and making a fortune from the enormous stock of spares and project bikes you amassed as your toe-in-the-water became an obsession. Obviously, your wife will have left you sometime in 2019, but the kids still visit, you can eat in your pants and the dog’s stayed loyal. Welcome to world of modern classics.